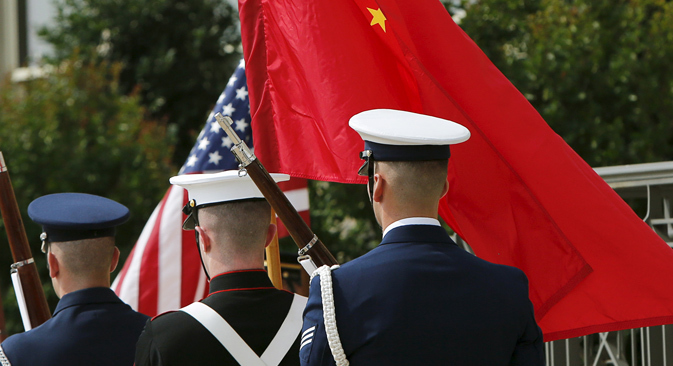 The U.S. and China have signed a collaboration agreement on military dialogue. According to the Chinese media, it is the first agreement of its kind in the last several years. While Russian experts believe that for now this is most likely a protocol of intentions, they also think that any rapprochement between China and the U.S. amid Moscow's confrontation with the West is against Russia's interests. A new deal on military cooperation signed by Washington and Beijing threatens to undermine Russia’s efforts to forge closer ties with China, say Russian experts. Representatives of the U.S. and Chinese defense ministries signed the agreement on the mechanism of interactivity of troops when coordinating humanitarian efforts and reactions to emergency situations (), on June 12. The sides are expected to sign a security agreement by the end of September that will help reduce the likelihood of incidents occurring between the two countries’ armed forces in the air and at sea. The American military says that these agreements will create a better mutual understanding and lower the risk of any accidental confrontations. Meanwhile, China is calling the agreement a big step forward in Sino-American relations. As a result, there have already been announcements about possible American-Chinese military drills in 2016. Russian experts believe that the signing of the agreement alone helps understand Washington and Moscow's place in Beijing's geopolitical calculations. This is particularly topical in the light of the recent rapprochement between Russia and China as a result of the confrontation between Russia and the West. Vladimir Korsun, China scholar and professor in the Asian Studies Department at the Moscow State Institute of International Relations, said that the signed agreement is most likely only a protocol of intentions for now, adding that China and the U.S. started concluding military agreements back in the 1980s. Experts believe that while the agreement does not have any signs that would indicate Washington and Beijing are forming some kind of military alliance, it does demonstrate the character of relations between China and the U.S. For example, Korsun states that "de facto the G2 (the U.S.-China duo) already exists,” alluding to the realistic concept of Chimerica introduced by historian and Harvard professor Niall Ferguson, a theory that supposes the existence of a single American-Chinese economic space suiting both countries. Moreover, Korsun also remarked that in the middle of the 2000s the majority of Russia's expert community was inclined to think that a future conflict between the U.S. and China was inevitable, while Russia would have to maintain a distance and "watch the battle of the two tigers" from the sidelines. However, this forecast has not come to pass and the American-Chinese agreement signed on June 12 is further testimony that this outcome remains unlikely for now. For this reason, Korsun is convinced that in the event of a further aggravation in relations between Moscow and Washington, Russia will not have China on its side. At the same time some experts believe that a full-fledged alliance between the U.S. and China is extremely unlikely. This, however, does not make Russia's current situation any better. Alexander Khramchikhin, deputy director of the Institute of Political and Military Analysis, said that the Russia-U.S.-China triangle is experiencing difficult relations. In this configuration each of the three countries is playing on the contradictions between the other two and the forging of closer ties by any two countries goes against the interests of the third. Even though it is hard to imagine a real alliance between any two players, the tactical convergence between Washington and Beijing is leaving Moscow with less space for maneuver. Andrei Frolov, editor-in-chief of Export Vooruzheny magazine, also believes that the Chinese-American agreement, which he calls a memorandum of understanding, is a sign of a certain rapprochement between the U.S. and China. However, he underlines that in the next couple of years this should not have any practical consequences for Russia.